Did the Russian Prime Minister Declare that Aliens have Visited Earth? Discussion in 'Science' started by HereWeGoAgain, Jun 22, 2018. Does anyone speak Russian? He allegedly thought the camera was off. No, but isn't it more likely to mean foreigners than extraterrestrials? More likely? Wouldn't it be good to have a known translation before arriving at any conclusions? As quoted, no he specifically referred to beings that have visited our planet in the past - if that's translated correctly. He also appears to be joking at the end. But he also appears to be serious for most of the discussion. I would just like to know if its even translated correctly. @Destroyer of illusions we need your skills as a Russian troll to listen to the video and tell us what it says in English. No kidding! I was thinking the same thing. Where's a Russian troll when you need one?!?! The Prime Minister mocks the feeble-minded. Those who believe in Western media. He talks about aliens and other nonsense. I hope the American trolls understand what irony? So defensive!!! Are you embarrassed? So you are unable to translate it. Got it. Logically , the non-observable and observable Universe is infinite. Thus it would be naive to think there is no other existence of intelligent life forms outside of our locality. That being said, perhaps the ''aliens'' visited the Earth and stayed here, meaning us. Where in the ''rules'' does it say we are indigenous to the Earth? One day I spent on hour on the phone with Ret Col Halt, discussing this event. Just a few of the more interesting cases, off the top of my head. If I thought hard about it I could list many pages. Quite a few years ago now, I read every declassified UFO document available from the NSA, CIA, FBI, DOD, The Navy Dept, and others - thousands of documents! It was not only fascinating and surprising wrt to UFO reports, it was also an adventure in the history of the cold war going back to 1947. There were even reports of the Foo Fighters - mysterious lights that sometimes followed or even ran circles around bombers and attack groups - reported by both US and German pilots, during WWII. We thought it was them and they thought it was us! Can't list top cases without mentioning the Coyne Helicopter event. Regarding the Big Sur event in post #14, I contacted Jacob's commanding officer, Major Florence J. Mansmann, and spoke with his wife. He was too ill to speak at the time but she was glad to have a discussion. She confirmed that her husband stood by Jacob's report and said I should try calling back in month or so. I did, and he had passed away. But again she iterated that he stood by this story until his death. He saw the film. The Ariel School incident is quite fascinating. Watch the interviews with the children. I also found this interview with two of the children, over 20 years later, interesting as well. NO, they only saw the planet Venus !!!! Indeed. The real irony of some explanations, esp the famous swamp gas explanation, is that they were posited by Dr. Allen J. Hynek, who was hired by the government to debunk UFO reports. He became a total convert and the first scientist to openly study the UFO phenomenon. Another fascinating case is that of Travis Walton. The movie Fire in the Sky is about this event. What makes it compelling is that 5 witnesses passed lie detectors tests during a murder investigation, when Travis Walton was allegedly taken by a UFO. The police thought they were hiding a murder. The official police report is available. It was determined that the witnesses were being truthful when they described a large UFO that "zapped" Walton with a beam of light, knocking him back through the air ten feet. They took off in fear for their lives and Walton disappeared for the next five days. When he finally showed up again, he claimed he had been taken by aliens. He too passed several lie detector tests. He failed one on a game show. The results of tests given by the police to the other witnesses is out there but I couldn't spot it at the moment. I've linked the official document before though. It is in the public domain. Another interesting case is the 1952 Washington, D.C. UFO incident. We knew immediately that a very strange situation existed . . . their movements were completely radical compared to those of ordinary aircraft. Barnes had two controllers check Nugent's radar; they found that it was working normally. Barnes then called National Airport's radar-equipped control tower; the controllers there, Howard Cocklin and Joe Zacko, said that they also had unidentified blips on their radar screen, and that they had seen "a bright light hovering in the sky...[it] took off, zooming away at incredible speed." Cocklin told Zacko "Did you see that? What the hell was that?" ... Captain John McHugo, the flight leader, was vectored towards the radar blips but saw nothing, despite repeated attempts. However, his wingman, Lieutenant William Patterson, did see four white "glows" and chased them. He later said that "I tried to make contact with the bogies below 1,000 feet. I was at my maximum speed...I ceased chasing them because I saw no chance of overtaking them." According to Albert Chop, when ground control asked Patterson "if he saw anything", Patterson replied "'I see them now and they're all around me. What should I do? '...And nobody answered, because we didn't know what to tell him." After midnight on July 27, Major Dewey Fournet, Project Blue Book's liaison at the Pentagon, and Lieutenant John Holcomb, a United States Navy radar specialist, arrived at the radar center at National Airport. During the night, Lieutenant Holcomb received a call from the Washington National Weather Station. They told him that a slight temperature inversion was present over the city, but Holcomb felt that the inversion was not "nearly strong enough to explain the 'good and solid' returns" on the radarscopes. Fournet relayed that all those present in the radar room were convinced that the targets were most likely caused by solid metallic objects. There had been weather targets on the scope too, he said, but this was a common occurrence and the controllers "were paying no attention to them." Two more F-94s from New Castle Air Force Base were scrambled during the night. One pilot saw nothing unusual; the other pilot saw a white light which "vanished" when he moved towards it. Additionally, "civilian planes flying into Washington reported seeing strange glowing objects in places where the radar was getting blips." As on July 20, the sightings and unknown radar returns ended at sunrise. This event is reenacted in the finals scenes, in a very dry but informative documentary on the early days of modern UFO phenomena. This is based on the experiences of Albert Chop, a former military man and journalist who was assigned as the Chief of the Press Section at the Air Material Command center. Another name that pops up in this is that of Captain Ruppelt, who headed the USAF's Project Bluebook - the official investigation into this phenomenon. In fact he is the one who coined the expression "UFOs" for the Air Force. The meticulous account of the top military brass on UFOs in the United States. 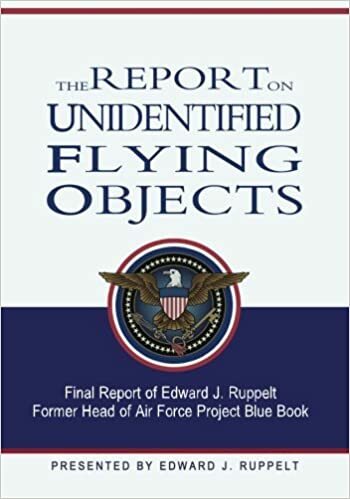 Written and documented by the former head of the Air Force Project Blue Book, the federal organization in charge of a formal government study of UFO's. "It is without question the most satisfactory and satisfying evaluation of saucer sightings to appear in print." --Cleveland Plain Dealer "Ruppelt’s book is an objective, calmly written work that should be in the hands of every sober student of the UFO mystery." --Baltimore Sun "His investigations, as his writings indicate, were thorough, unbiased and competent. I can think of no one better qualified to write on the Air Force activities in this regard. His book is a splendid account of this work, readable and enjoyable. It should be of wide interest to both the professional and the layman." --F.C. Durant III, President International Astronautical Fed. The United States government has done a very good job of confusing the U.F.O. phenom to the point of eliminating the Public urgency to "Know" what they know. Personally I find the cases of JFK and Carter to be very good indicators that there is something to this that goes very deep. JFK was about to expose the details and dies, Carter was also about to until he saw the details and then no one hears anything more....it just seems strange. I'm guessing Majestic12 evolved into something else and went underground. Figuratively and technically. I stay away from conspiracy theories and focus on the well-documented and highly compelling events. But during my years of exploration, I contacted among others, Ed Mitchell, one of the original astronauts who walked on the moon; a Navy Captain, a Sc.D. out of MIT, and a big believer in the UFO phenomenon - that some are alien spacecrafts. He believes that the government doesn't control the information. It is all in the hands of private contractors. He also claims to know [or knew] someone who has seen an alien. Striking considering the source. That is the other thing about this phenomenon that is widely misunderstood. The original UFO "nuts" were mostly military and intelligence people - not Bubba and Bubba-Jo. The most compelling evidence of all comes directly from military archives - officially documented events involving the military. When people talk about conspiracies, I tend to ask, what conspiracy? I can show you plenty of government documents where they don't seem to hide anything. And even redacted documents may discuss the UFO, but merely delete names of people and other unrelated details. This is sometimes seen in retrospect. The only reason the UFO was classified, was out of concern that it might be Soviet of Chinese technology. Once that is ruled out, the document is declassified upon a FOIA request. There are about 1 billion classified documents from the cold war era. If it requires 1 hour to review and declassify each document, which is very optimistic, it would require over 114,000 years for one person working 24/7 to declassify all the documents. So in many ways it is just a problem of time and cost, and not a matter of secrecy. One of my favorites, Feb 25, 1942, the so-called Battle of Los Angeles. My father was there but only remembered the sirens and lights out, and picking up artillery shells the next morning. My Aunt was a young mother home alone with two babies, and a husband just shipped overseas after the attack on Pearl Harbor. An Ack Ack gun was in her neighbor's backyard and started firing in the middle of the night. And it was known that Japanese subs shelled an oil field a few nights earlier. It was such a terrifying night that 50 years later she still wouldn't talk about it. Too slow for an aircraft, no balloon or blimp could have withstood the barrage of molten steel exploding in the skies as 1400 rounds were fired at it; while moving over 60 miles at speeds around 1 mph. It changed directions several times before disappearing out over the ocean. A now deceased professor named Littleton was a child then and saw it pass right over his house. He spent the rest of his life talking about it. He believed he saw an alien spacecraft. This is the original radio broadcast.